INTRODUCTION: In recent years there has been a movement to promote patients as partners in their care; however this may not always be possible as in the case of critically ill patients, who are often sedated and mechanically ventilated. This results in family members being involved in the care of the patient. To date, this type of care has been represented by three dominant theoretical conceptualizations and frameworks one of which is family centered care; however there is a lack of consensus on the definition of family centered care. Hence the objective of this study was to explore the meaning of family care within a South African context. METHODOLOGY: This study adopted a qualitative approach and a grounded theory research design by Strauss and Corbin (1990). Participants from two hospitals: one private and one public were selected to participate in the study. There was a total of 31 participants (family members, intensive care nurses and doctors) who volunteered to participate in the study. Data collection included in-depth individual interviews. Open, axial and selective coding was conducted to analyse data. Nvivo data analysis software was used to assist with the data analysis. FINDINGS: The findings of this study revealed that family care is conceptualized as togetherness, partnership, respect and dignity. CONCLUSION: During a critical illness, patients' families fulfil an additional essential role for patients who may be unconscious or unable to communicate or make decisions. FMs not only provide vital support to their loved one, but also become the "voice" of the patient. In recent years there has been a movement to promote patients as partners in their own care; however this may not always be possible as in the case of critically ill patients, who are often sedated and mechanically ventilated. This results, in the family members (FMs) being included in partnerships with health care professionals (HCPs), providing care to critically ill patients. To date, this type of care has been represented by three dominant theoretical conceptualizations and frameworks for families namely: family as a context; family as a unit and family as a system (Segaric & Hall, 2005,p.211; Wright & Leahey, 2000,p.10).Familyas a context is operationalized in family centered care (FCC) models of practice, however FCC seems to be at a cross roads today. Fundamental misunderstandings persist about what is FCC, how to implement FCC and how to determine the family-centeredness of care. Health care needs cannot be met unless greater understanding is achieved by HCPs. A consensus definition of FCC practices and actions has not been achieved to date even though considerable agreement has been achieved on FCC principles (Kuo et al., 2012,p. 297). Majority of research around FCC has been completed internationally however there is limited research within critical care in the South African context, hence this article reports on the conceptualization of family centered care (within the South African context and more specifically during critical illness. Critical illness often occurs within). Critical illness often occurs without any warning, giving patients and their families no time to prepare themselves (Söderstrom, Saveman, Hagberg, 2009, p. 251). Sudden hospi-talization, especially into an intensive care unit (ICU), is unexpected and the family faces the possibility that their loved one may die or be severely disabled (Brysiewicz & Bhengu, 2010, p. 42). These psychological repercussions of critical illness may reduce the families' ability to cope with the situation (Hickman &Douglas, 2010, p. 81). Health care professionals are well placed to provide psy-chosocial support and specific illness related information to (FMs) following the patient (Chien, Chiu, Lam, & Ip, 2006,p. 40). HCPs can be proactive in their approach to family care. They can do much to improve communication and decrease anxiety and depression in family members (McAdam & Puntillo, 2009, p. 200). Research studies have been conducted in the USA, England, Sweden and Finland on support provided to FMs in ICUs, and although these have been predominantly quantitative studies (Bailey, Sabbagh, Loiselle, Boileau, & McVey, 2010,p.114;McAdam & Puntillo, 2009,p. 201; Ágárd & Harder, 2007, p. 172; Takman & Severinsson, 2006, p. 121; Auerbach et al., 2005, p. 203), there has been a growing interest in qualitative studies in these countries. However, in Africa, more particularly South Africa, this area of family research is relatively under-researched. Irlam and Bruce (2002:28) conducted a literature review on the attitudes and knowledge of nurses on family care in paediatric and neonatal units in the Gauteng Province of South Africa. This study revealed that family care is difficult to define, mainly due to the lack of consensus about its meaning. Additionally, the diverse societal contexts within which family care is applied further complicate its definition. Irlam and Bruce (2002:28) proposed that a family centered model for the South African context needs to be developed with the focus on parent participation. Brysiewicz and Chipps (2006:68), both South African nursingresearchers, conducted a review of the effectiveness of international in-hospital psychosocial intervention programmes for family members of critically ill patients and concluded that attempts to assist family members within an ICU are worthwhile. They proposed further investigations to ensure the development of culturally appropriate interventions, especially in the South African context. This is echoed by Saloojee, Rosenbaum, Westaway and Stewart (2009:23), who also suggests that there is a lack of family centered care research within South Africa, especially in resource-constrained settings and cross- cultural environments. The South African health care system comprises of public and private health care sectors, with delivery of services shifting from a curative hospital based approach to a comprehensive primary health care approach. Only 16% of a 52.98 million South Africans are covered by medical insurances and are served by the private sector with the remaining 84% being served by the public sector (Naidoo, 2012, p. 149). The public sector is funded by taxpayers' money and consumes 40% of the South African health care expenditure (De Beer, Brysiewicz & Bhengu, 2011: 6). Efforts to redirect services to primary health care have resulted in limited resources for critical care (De Beer et al., 2011:6).In addition to this, South Africa is challenged by an acute shortage of ICU trained nurses. The shortage of skilled nurses has resulted in nurses working more than the recommended hours resulting in them being exhausted, with a decreased level if alertness and low morale (De Beer et al., 2011:8). South Africa is a country of diverse racial and ethnic groups; all having different religions, languages and cultures. Thepatientpopulationinthehealthcarefacilitiesispre-dominantly black African. Traditionally, African beliefs are predicated on principles such as value of collective interest of the group and the traditional African person cannot exist alone: "his identity is totally embedded in his collective existence" (Van den Berg, 2006,p.43).The involvementof traditional sources of community support, such as traditional healers, and chiefs are vital in dealing with death and crises, as well as cultural traditions for handling major life events. It is, therefore, significant for HCPs to understand their culture and provide culturally appropriate care for patients (Brysiewicz & Bhengu, 2010,p.50).Inaddition Brysiewicz and Bhengu (2010:42), also suggest that because health care units adopt a biomedical culture, HCPs should be aware of the health-illness beliefs of their patients and reflect on how these interact with the health care system. As a result of this, the researchers embarked on a research study that aimed to explore the meaning of family care within a South African context. There are various definitions for caring for families in the international scene among which are family nursing, family systems nursing and family centered care. The aim of the study was to explore and describe the conceptualisation of family care during critical illness in Kwa-Zulu-Natal. For the purpose of this study, FMs include the spouse, parent or child (18 years of age or older), or any person(s) who plays a significant role in the patient's life. The definition may include a person(s) not legally or biologically related to the patient. Critical illness refers to patients who have a life threatening illness who are on supportive treatments and close monitoring to prevent life threatening complications. An ICN is registered with the South African Nursing Council and has a post basic qualification in intensive care nursing, or has had experience working in an ICU. This is a specialized area of nursing that involves caring for patients who are undergoing life threatening illnesses or injury. The environment in ICUs is highly technological, requiring nurses to have a broad knowledge base, a high level of decision making skills and regard for patients and families in vulnerable circumstances. Intensive care nursing involves constant, complex, and detailed healthcare provided in acute life threatening conditions. Grounded Theory (Strauss & Corbin; 1990: 12) research method was chosen as the phenomenon of family care is relatively under-researched in this context. Grounded theory is particularly well suited to "uncover and understand what lies behind any phenomenon about which little is yet known" (Strauss & Corbin, 1990, p. 19). Further to this, the choice of grounded theory fitted the research paradigm. Epistemologi-cally the assumptions that the world consists of multiple individual realities influenced by the context, was relevant (Mills, Bonner, & Francis, 2006, p. 154). Ontologically, reality was viewed as being subjective and multiple; and axiologi-cally, the researchers took the stance that all research is value laden and that biases would be present (Creswell, 2007, p. 60). Hence I the researchers chose the Strauss and Corbin (1990:12) grounded theory approach because it provided an epistemo-logical and ontological fit to their position. The ICUs of two hospitals in the eThekweni district of KwaZulu-Natal were chosen for this study, one a private hospital and the other a public hospital as the context for the study. The study participants included doctors and intensive care nurses (ICNs) working in the ICUs of these hospitals. It also included FMs of patients admitted to these units. Initially, purposive voluntary sampling was utilized. This was followed by theoretical sampling which was achieved by purposefully moving from situation to situation and person to person to gather data on theoretically relevant categories and subcategories. The inclusion criteria included all FMs who had a loved one admitted to the ICU following critical illness. Nine in-depth interviews were conducted with FMs. Participants also included ICNs and doctors working in the ICUs with a minimum of six months of intensive care experience. 23 in-depth interviews were completed, with 17 of these respondents being ICNs and six being medical doctors. The data collection process started after receiving the necessary permission from authorities. The researcher then contacted the nursing services managers of the hospitals proposing dates and times for the commencement of data collection. Once the researcher received permission from the different authorities, she requested permission from the unit managers of the ICUs, setting up a date and time to initiate data collection. This resulted her gaining access to the ICUs where she approached participants to part take in the study. Data was collected through the use of in-depth individual interviews. At the beginning of each interview, the researcher explained the nature, purpose and the significance of the research to the participants and told them about the estimated amount of time required for the interview. All interviews were conducted in English. As all participants were able to speak and understand English. However, some of the isiZulu speaking participants' utilised code switching during the interviews. Code switching involved participants who were describing their meaning of family care switching from English and using a few isiZulu words during the interview. However the participants were able to explain their experiences in English when asked to translate the isiZulu words into English. The translation was verified by an isiZulu speaking nursing academic at the School of Nursing at the University of KwaZulu- Natal. Each interview lasted between 30 and 45 min. Participants were approached by me whilst in the ICUs to partake in the study and once they agreed, interviews were conducted in a place that was convenient for them. FMs were interviewed in an ICU cubicle that was unoccupied and private and HCPs were interviewed in tea lounges of the various units. I ensured that the tea lounges that was used for interviews was only utilised when it was unoccupied by other staff members. Data collection and analysis occurred simultaneously. Data analysis commenced after the first interview was transcribed verbatim and started off with open coding where the researchers became familiar with the text so as to enhance the coding and analysis process. This involved looking at each line and allocating concepts to words or phrases. The data was also broken into incidents and compared with other incidents and other data to develop concepts. These concepts were then analysed and those relating to a common concept were assigned to find higher commonalities called categories, thereby reducing the number of concepts. Open coding was followed by axial coding by looking at the full list of categories produced at the end of open coding. Labelled categories were grouped together under the same headings. The labelled categories were further analysed by assessing them individually in terms of their dimensions and properties. This allowed sub-categories to emerge on the basis of how they related to the category in question. Categories were also assessed by discovering and relating categories to each other. The data was analysed using NVIVO. Ethical clearance was sought from the university's Ethics Committee after receiving approval to conduct the study from the School of Nursing. Permission was also sought from the necessary authorities of both the private as well as the public hospitals. Once this initial permission was obtained, the researchers then approached potential participants to set up a convenient time for data collection. All participants were presented with a written English or isiZulu information document explaining the purpose and significance of the study. Thereafter written permission was obtained from all participants and participants were made aware that participation was voluntary and that they had the right to withdraw from the study at any time. Permission to tape record the interviews was also sought and participants were ensured that anonymity and confidentiality was maintained. The interviews were carried out in a place chosen by the participants, thus ensuring privacy. FMs were considered vulnerable participants due to the sensitive nature of the data collected. Upon interviewing, if FMs required counselling or debriefing. The researchers ensured that a social worker or psychologist was available to provide this service. The services of the social worker or psychologist were also available to HCPs if they needed it. The researcher followed the strategies of credibility, dependability, confirmability and transferability (Guba & Lincoln, 1985) to ensure trustworthiness. Credibility was ensured by space triangulation by collecting data on the same phenomenon from two sites: private and public, to test for cross-site consistency. Credibility was also achieved by peer debriefing. Dependability was achieved by the researcher given a detailed methodological description to allow for the replication of the study. A confirmability trail was also established by me recording the research activities over time so that others can follow the research process undertaken. The researchers ensured transferability by me providing sufficient thick descriptions, by presenting detailed descriptions of the research settings, participants, data collection methods and time frame of data collection. Validation of the research findings was achieved by the researchers providing feedback about the emerging data and interpretations to participants to ensure it was a true reflection of their reactions. However, the study participants did not suggest any changes. Demographic data from the nine FMs revealed that the mean age of family participants was 31.5 years of age, with women constituting n = 8 and males n = 1. From the total sample, n = 5 of respondents were from the private sector and n = 4 were from the public sector, with the majority of participants being Christians (n = 9), with n = 3 being Hindu. Of the n = 9 participants n = 3 participants were Black African, n = 2 Whites and n = 4 Indians. The diagnosis of the patients admitted to ICUs included motor vehicle collision, aortic abdominal repair, myocardial infarction, respiratory arrest, subdural haematoma and eclampsia. Participants also included 16 ICNs and six doctors working in the ICUs with intensive care experience ranging from a minimum of 6 months to a maximum of 20 years. The mean age of the healthcare providers were 30 years with females (n-11) and males (n = 11). The findings of the study are presented using isiZulu words that represent NVIVO codes that emerged during the study. Table 1 reflects a summary of the findings. Participants defined family care as Ubuntu, an Nguni word that when translated into English means togetherness. Family care was also defined by participants as working through the critical illness as, "simunye" (we are one). Providing FMs with the information they need and allowing for shared decision making was seen as important in creating collaborative partnerships between FMs and HCPs in the care of the patient. Participants indicated that FMs should be an equal part of the healthcare team. The findings revealed that the participants believed that respect is an important element of family care. They agreed that the diverse cultural values, beliefs, lifestyles and practices of patients and their FMs need to be respected. This also referred to HCPs setting aside their own cultural values in order to accommodate the culture of the patient and FMs being cared for. Participants reported that acknowledging the diverse cultures of FMs made it easier for them to deal with the stress of an ICU admission. The critical illness of a patient was seen as a shared responsibility between HCPs and FMs and not an experience that FMs had to endure by themselves. Many participants perceived that the meaning of FC in this context draws from the African philosophy of Ubuntu which also means 'hu-manness or humanity towards others, and which was also referred to as engaging with each other as a family within the ICUs. According to Tshoose (2009:12) Ubuntu, an Nguni word from the aphorism: 'Umuntu Ngumuntu Ngabantu' (I am because we are" and "a person is a person because of other people" (Mbigi, 1997, p. 2)) is fundamental to the African culture and express primary values of intense humanness, caring, sharing, respect, compassion and associated values, thus ensuring a happy and quality community life in the spirit of family. The philosophy of Ubuntu also illustrates how an African is anchored within community and connected to the members of his community. The Collective Fingers Theory, developed by Mbigi (1997:2), describes the collective African way of life in his theory which can be best explained using the African proverb, 'a thumb, although it is strong cannot kill aphids on its own. It would require the collective co-operation of other fingers' (Mbigi & Maree, 2005, p. 110). Collectivism is the backbone of the Ubuntu way of life because without a collective mindset, many South Africans would not be able to practice the social values of Ubuntu. This is in keeping with the findings of this study as participants referred to managing a critical illness collectively as a family, where family did not mean biological bonds, but rather bonds of solidarity. Participants also conceptualized family care as the involvement of FMs in the care of the patients. Being able to help the patient with physical care is beneficial for FMs as they derive satisfaction from the process. Allowing FMs to provide physical care, such as active and passive exercises or just touching the patient, not only make FMs feel needed and useful, but was also seen as important in the care of the patient. Family involvement is an important aspect of an African community, which is associated with certain behaviour and social roles. According to the principles of Ubuntu,FMs are expected to show compassion and caring as this articulates a sense of humanity. Participants, therefore, perceived family involvement in the care of a loved one as an opportunity to honour this commitment, and viewed it as a core component in the definition of family care. Researchers have consistently found that FMs want and need to be involved in the provision of patient care because it allows them to be closer to the patient and gives them a sense of being involved (Kinrade, Jackson, & Tomnay, 2009,p.86; Auerbach et al., 2005, p. 203). FMs feel that being allowed to participate in the nursing care of a loved one positively affects the welfare of the patient (Mitchell & Chaboyer, 2010, p. 154). However, although family involvement has been identified as a core element of the meaning of family care in this study and also the study conducted by Hammond (1995:257) it has been identified that in some cases FMs are not comfortable with being involved in the physical care of a loved one, but may feel obliged to participate to reduce the workload of nurses (Hammond, 1995, p. 257). According to Engström and Söderberg (2004:300) some FMs wanted to assist in the physical care of the patient, others placed confidence in the ICU staff and wanted them to be responsible for most of the care of the patient. Family care was also conceptualized by participants as respecting the presence of FMs in the ward, respecting their knowledge and opinions about the patient and care, respecting their values, beliefs, culture and treating them with dignity at all times. As South Africa, and more specifically KwaZulu-Natal, is a diverse cultural society, patients and FMs in the ICUs can have a range of cultural beliefs, in many instances differing from those of the HCPs who are caring for them. Although this could lead to conflicting opinions and practices, the participants of this study felt strongly that all cultural beliefs and practices should be respected. In the current study, some respondents linked the concepts of respect and dignity within family care to the social values of Ubuntu. Amongst Africans, respect and dignity are central to the values of Ubuntu and the collective fingers theory discussed above, because it is only through respecting others and according them dignity that one can gain trust (Poovan, Du Toit, & Englebrecht, 2006, p. 17). Consideration of dignity in health care began in the context of palliative and end of life care in hospitals, hospices or homes (Abiven, 1991, p. 2) but has broadened to include discussions of health and social services provided to a wide range of vulnerable and marginalized individuals, such as FMs of critically ill patients (Jacelon, 2003, p. 545; Miller & Keys, 2001, p. 340). The findings of this study are also suggestive that the respect and dignity for FMs presence created a sense of 'social capital for the patient. Social capital can be linked to the social value of solidarity seen in Ubuntu,asit is defined as "the bonds of community that in myriad ways enrich our lives" (Putnam, 2000, p. 18). When individuals develop connections with each other, these linkages help promote prosocial behaviours and attitudes, and are sources of social support for each other (Stephens, 2007, p. 110). Even though social capital concepts have seen increasing use in community development (Kawachi & Berkman, 2000,p.30) social capital literature intersects closely with those of health promotion as it embodies core elements of health promotion, namely participation, empowerment and collective action (Bracht, 1990,p.14).Theuseof'bondingsocial capital could be a particularly important resource for FMs and patients during critical illness as caring social relationships between FMs and the critically ill patient could have powerful beneficial effects on the health of the patient. Eggenberger and Nelms (2007:1618) reported that the critical illness of a loved one forces FMs to live the unknown, which is painful as they struggle and suffer through this experience. However, because they have each other and the powerful bonds between them, they endure the situation as a family. In relation to the findings of this study, it is evident that bonds do exist between FMs and patients, and FMs reiterated that allowing them to be present gave them a sense of control of the situation. 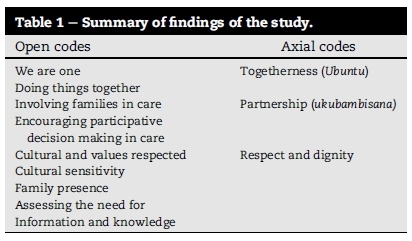 As much as respect and dignity for family presence was seen as an important element of the meaning of family care, the findings of this study are indicative that, in some instances, their presence was undervalued by the influence of the medical model of caring. The study was conducted in the eThekweni area in KwaZulu-Natal, South Africa. This study setting was confined to an urban setting, and although it covered both the private and the public sectors, a rural setting was not taken into account. This means that the findings only reflect the experiences of FMs and HCPs of the urban setting and that the experiences of FMs and HCPs in a rural setting could be different. Furthermore, KwaZulu-Natal is one of nine provinces within South Africa and the cultural dynamics could be different in the other provinces. Hence the findings related to culture within this study could possibly be limited to the province of Kwa-Zulu-Natal. Due to the fact that this study appears to be the first family care study in intensive care nursing in South Africa, more research needs to focus on FMs in ICU with the aim on improving nursing practice and nursing education. This should extend to research that focuses on improving the education of nurses in understanding families, theories related to family care and concepts related to the phenomenon of family care. This grounded theory study allowed for the conceptualisation of family care during critical illness in the context of South Africa and highlighted that the family is the single greatest social institution that influences a person's health. Moreover during a critical illness, patients' families fulfil an additional essential role for patients who may be unconscious or unable to communicate or make decisions. FMs not only provide vital support to their loved one, but also become the "voice" of the patient. Similarly FMs have to work collaboratively and in solidarity with HCPs in achieving the best possible outcome of the critical illness. E-mail addresses: debeerj@ukzn.ac.za (J. de Beer), brysiewiczp@ukzn.ac.za (P. Brysiewicz). Peer review under responsibility of Johannesburg University. * Corresponding author. Fax: +27 031 260 1543. 1 Fax: +27 031 260 1543.